Have over 350 World History Maps at your fingertips. 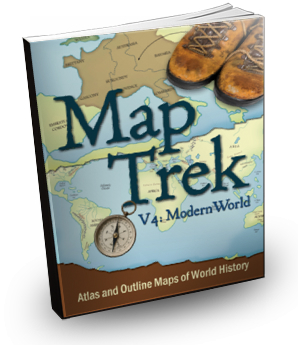 When you purchase Map Trek Historical Atlas and Outline Maps using the download option, we'll throw in our American Maps set for free. That's an extra 235 printable maps for your family that you can begin using today. Combined with the World History maps above, that is a total of 465 maps that you can use with your students starting today. 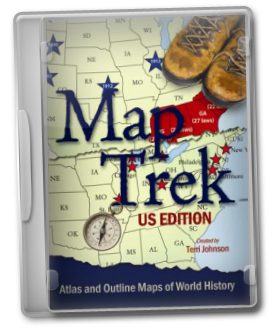 The Map Trek: US Edition includes 53 historical maps and 53 unlabeled maps, including maps from the Revolutionary and Civil wars, Westward Expansion, the Great Depression, the World Wars and more. Also, there is a map for each state as well as a large map of the 50 United States. 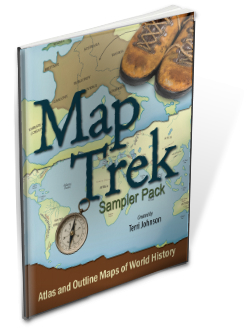 Order Map Trek: The Complete Collection With Credit Card Over our Secure Order Form! This offer may be available only for a limited time! Prefer to buy the 2 CD-ROM set for $49.95 - Click Here. Prefer to purchase the hardcover version instead - Click Here. Looking for the Individual Map Sets?